Underinsured Struggle To Afford Health Care Improved medicines and treatments are increasing life expectancy for people with cystic fibrosis. But insurance doesn't pay for enough of those medical costs, leaving families affected by the disease to struggle with the financial consequences. 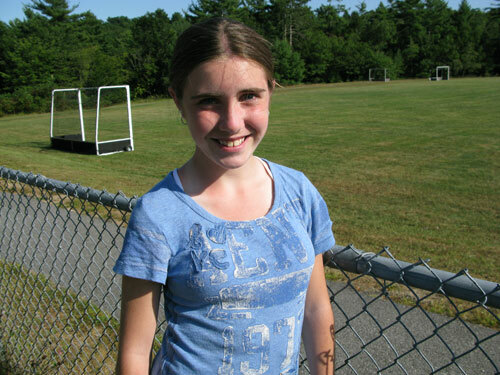 Cailyn Fowler, 13, leads a pretty normal life. But it all depends on her getting good health care. Jason and Stacy Hunnewell are struggling to pay the bills for treating their 8-year-old daughter Abbie (center) for cystic fibrosis. You may know cystic fibrosis as a killer of teens and young adults. But that isn't necessarily true anymore, as medicines and treatments keep improving and life expectancy keeps going up. The average life span for someone with the disease is now into the late 30s. But even though 99 percent of people with cystic fibrosis have health insurance, more and more of them are "underinsured." They have insurance, but it doesn't pay for enough of those expensive treatments. That's a big worry for Cindy and Randy Fowler of South Paris, Maine. Their 13-year-old daughter Cailyn has cystic fibrosis. A defective gene causes her body to make very thick and sticky mucus that clogs her lungs. Cailyn takes about eight medications, vitamins and supplements a day and spends a couple of hours each day getting treatment that involves putting on a bulky vibrating vest that shakes her lungs and loosens the mucus. Even with all that daily care, Cailyn gets lung infections that require hospital stays. She just spent three weeks in the hospital getting treatment — after spending a week in the hospital in August right before school began. 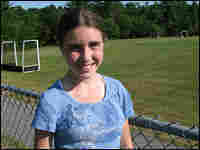 And yet Cailyn goes to school, she has a cute boyfriend, and she just finished her first year on the cross-country team. She is proud that at every meet, although she didn't finish near the top, she improved her time over each previous contest. She leads a pretty normal life. It all depends on her getting good health care. Randy Fowler gets health insurance through his maintenance job at a propane gas company. That insurance pays for most of Cailyn's care. But every year, the Fowlers say, there's still as much as $50,000 or more that's not covered by the family's health insurance — bills for Cailyn's medications, medical equipment and multiple trips to the hospital. The state Medicaid program pays for all of that — at least for now. Cailyn's disease makes it hard for her to digest food and to keep her weight up, so now she has a 1-inch piece of clear plastic tubing on her stomach. It's a feeding tube called a G-tube. At night, while Cailyn sleeps, she gets nutritional supplements through that tube. But that tube pokes out of her shirts. She has to take extra care of it, to make sure the skin around it doesn't get infected. The feeding tube makes her self-conscious, and it's Cailyn's goal to get rid of it by next summer. But before the tube can come out, Cailyn needs to gain five pounds. That's no easy task. She lost some weight during her recent hospitalization. If she can regain it, it will be a good sign — because it will mean she's healthy. Still, for kids with disabilities and their families, things are rarely that simple. In Cailyn's case, needing that feeding tube qualifies her for health insurance through Maine's Medicaid program. If the tube comes out, Cailyn's mother knows her family will almost certainly lose that supplemental insurance. "When she does have it taken out, I don't know what it will do with her health insurance," Cindy Fowler says. "I mean, of course we want her to have it taken out. I mean, that's the main thing. But we'll just have to deal with that, you know, when it comes to that. We'll do what we have to do." Not long ago, people with cystic fibrosis died young. Now, with new drugs and treatments, the average life expectancy has doubled to 37, and it keeps growing. "We have patients living into their 50s and 60s at this point," says Bob Beall, president and chief executive officer of the Cystic Fibrosis Foundation. "You know, this should be a time of great hopefulness in terms of the patients and their future." But a new survey by Beall's group finds that, all over the country, patients are struggling to pay for that life-extending health care. Some report that their insurers used to charge a small co-pay for each prescription — maybe around $25. Now they make the patient pay for 20 percent of a drug's entire cost. Some of the newer cystic fibrosis medications cost $20,000 or $30,000 a year. One result is that 1 in 4 patients say they skip some of those drugs, and 1 of 5 say they skip some of their important visits to the doctor. Beall says many others go deep into debt. "We've heard of people having to sell their houses," he says. "People go into bankruptcy, people borrow from relatives, they take two jobs. They're desperate. They love their children; they want to make sure they're providing the best care. You do what you have to do to make sure that they can afford the drugs." 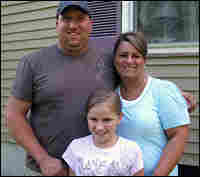 Another Maine family is also struggling with insurance problems. For the Hunnewells, in Hollis, Maine, it started with what should have been good news: Jason Hunnewell got promoted to foreman. He works for a company installing natural gas lines. But he was surprised when he found out that put him over the income limit for the state health program that supplemented the insurance he got from his job. That state insurance paid for a lot of his daughter's expensive care. Now the family's medical bills are piling up, and Jason worries that he's about to lose the house where he lives with his wife and four children, including Abbie, who has cystic fibrosis. Last year, 8-year-old Abbie spent more time in the hospital and sick at home than she did in school. "Abbie's condition hasn't changed," notes Jason Hunnewell, "but they're saying, because we're willing to put in the extra time or work, that now because of their guidelines we no longer qualify. What do you do? Do you pull back on work? Do you tell them at work: 'Don't give me a raise. Don't give me a promotion, 'cause it's going to hurt me'?" 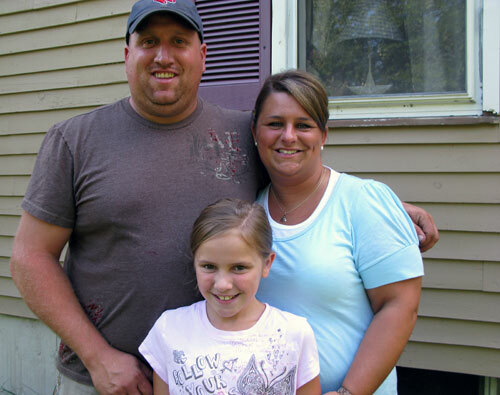 A sympathetic caseworker told Jason and his wife Stacy they could get back that supplemental coverage — if Jason worked less, or if Stacy stopped the part-time billing work she does for a nearby hospital. Or, there was one other really desperate thing they could do. "She said if we were to divorce," Stacy says — "Separate, legally separate," Jason adds, "so they could go on Stacy's income alone. So some oddball things, you know. Just, just not advice you'd expect to hear. You're always told growing up: 'Do your best. Work hard.' And we're being told the opposite. You know, it was just very disheartening to hear." Stacy Hunnewell has lovingly decorated the family's house in country-style decor, with barn stars, primitive art and stencils on the walls with words like "hope" and "dreams." Stacy says the family was able to buy the house two years ago because, at that time, Abbie had just gotten on the state's supplemental health insurance program. It helped cover Abbie's 13 expensive medications, her hospitalizations and other health care. "You know, having that program allowed us to say, 'OK, now we go out on our own and purchase our own home, we have that security now, we can do that,' " Stacy says. "And, you know, when we bought this home, we bought it thinking we would have that program. We got this house like everybody does — you have a budget, you know, a family budget, you have to live within your budget. And everything was good." But shortly after they moved in, Jason got his promotion, and because he was earning more, Abbie no longer qualified for the supplemental state insurance. Because the Hunnewells are paying thousands of dollars in medical bills now, they're behind on their mortgage. They worry that they're about to get kicked out of the house, so Jason takes on extra work. Some weeks, he works 70 or 80 hours putting down pipe. He doesn't get to see Abbie much these days. This year, when the ground freezes in Maine, he'll probably leave his family behind and go to a state where he can find work installing natural gas lines. It's the only chance he has to hold on to this house for his family and to make sure he can keep his daughter healthy. In some versions of this story, we mistakenly said that a "G-tube" was used for "intravenous feeding." In fact, such a tube is used for delivering food directly into the stomach.